Because they’re stupid, that’s why. They don’t work. They last for a day, a week, a month, and then most people give up on them. According to this site, only 8% of people actually succeed in completing their resolutions. And while 64% can keep their resolutions going past the first month, that percentage drops to 46% after 6 months. Personally, I know mine hardly ever last past the first month. I prefer to set attainable goals for myself throughout the year. Last year I vowed to myself that I would blog at least three times a week. How long did that last? Three weeks? And then because I had failed in my resolution, I didn’t blog for the rest of the year. 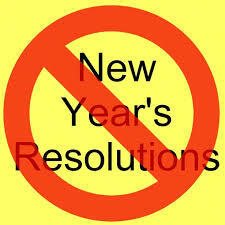 My other resolutions lasted about as long. However, in March when I decided to lose weight, because it wasn’t tied to a New Years resolution, I succeeded. The only pressure to succeed was from myself, not from keeping to a resolution. And look at the weight-loss resolution people. During the first weeks of January, they flood the gym. You can always tell who they are; they don’t have a clue what they’re doing, they wander around looking at things like they’re looking at complex medical devices, and their gym clothes look brand spanking new. And they are almost all gone by the time February rolls around. So resolutions don’t work. People make them, they stick to them for a while, and they become terribly depressed when they fail. I won’t fall into that trap again. 1) I’d like to be able to wear a bikini with confidence when vacation time rolls around. Not to say that I will, necessarily, but I’d like the option to be there. 2) I will try to blog on a regular basis. I’ve set alarms for myself to do so, and those alarms are set for three times a week. I may not be able to blog that much, but I’ll at least give it a shot. I won’t beat myself up if I miss a day here and there. I won’t quit blogging just because I don’t keep to this schedule. 3) I’m going to be better prepared for this holidays this year. I know it’s a bit early to be thinking about Christmas 2014, but as prepared as I thought I was last year, I was oh so wrong. I was beyond stressed about it, and the relationships in my life were suffering because of that. Both of my shops will be fully stocked by the time October rolls around, including extras of my best selling items. 4) I will work on my social life. I spend most of my time sitting in the house knitting, which is fine because I like doing it. But I need to get out and have fun sometimes. I really enjoy the people that I work with, and I’d like to hang out with them more outside of work. At lot of this is out of my control, as my illness dictates my social life more often than I’d like, but I’ll go out when I can. 5) As far as shop stuff; I’m happy with the direction of both shops. I’ve got a few new product lines planned for both (more styles of boot cuffs in my original shop, and a line of retractable badge reels in my second shop), but other than that, I’m just worried about building up my inventory after the busy holiday season. I would also like to exceed last years sales number and continue to grow both shops. 6) I desperately want to get outside more this summer. Last summer, the roomie/boyfriend was working so much that going camping, hiking, so much that going camping, hiking, kayaking and the like was kind of put on hold. This year I won’t let him hold me back. I’ll hike if I want to. I’ll take solo road trips. 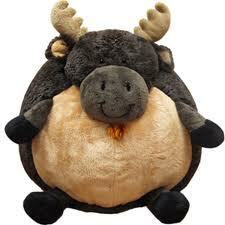 I’ll go back to Maine and finally see a damned moose, whether he wants to go or not. I’ll kayak by myself if I have to. Those are my goals. I’m sure I will come up with more throughout the year, just as I’m sure that I will amend the current ones. I may decide that I want to focus on one specific topic for this blog (although, how boring would that be?). I may decide that the idea of a 33 year old on the beach in a bikini is ridiculous. But you know what? That’ll be just fine. The pressure that comes along with resolutions isn’t there. And as far as I’m concerned, all these goals are easily achievable. What do you think? Do you do the whole resolution thing every year? Do you reach them, or give up on them partway through?